I didn’t take a nap yesterday afternoon. I got started on the 17th century fairy costume for my Bru (see My 17th Century Bru Fairy). This is my inspiration. I will be creating the costume from the inside out, starting with the smock. The smock is like a long-sleeved chemise made out of linen. 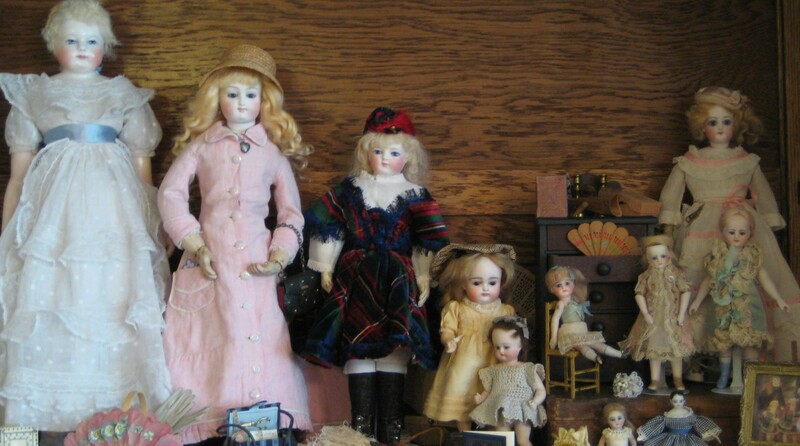 One of my doll friends found some very fine, antique linen yardage at a flea market and generously shared it with me since she knew about my fairy project. The top of the smock shows above the jacket/bodice of the costume. 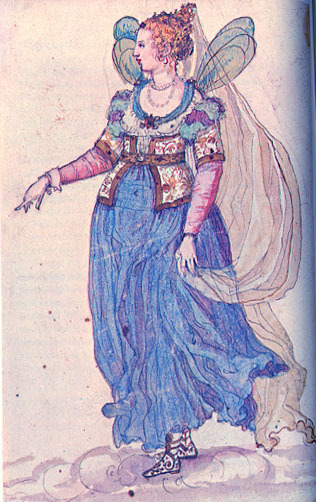 In the illustration it has a round collar trimmed with blue fabric. Mine will have a square, embroidered collar, similar to this one. 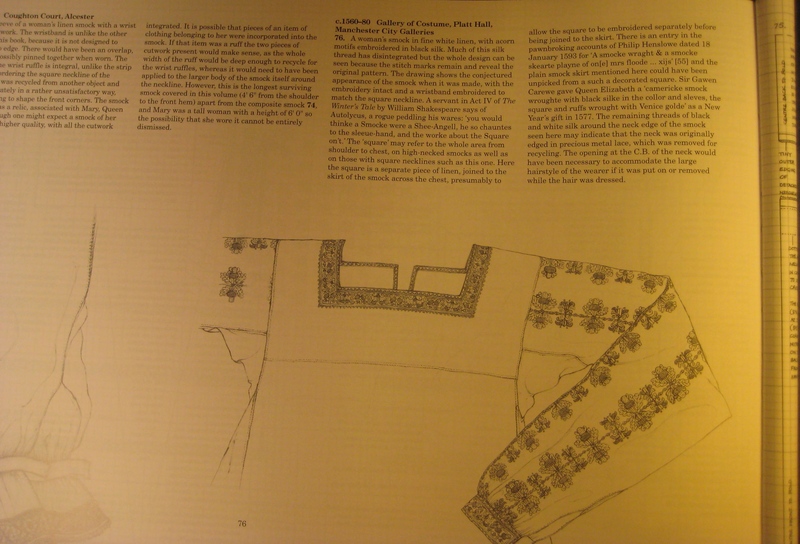 I found it in the book Patterns of Fashion 4, by Janet Arnold, which I got on Amazon. 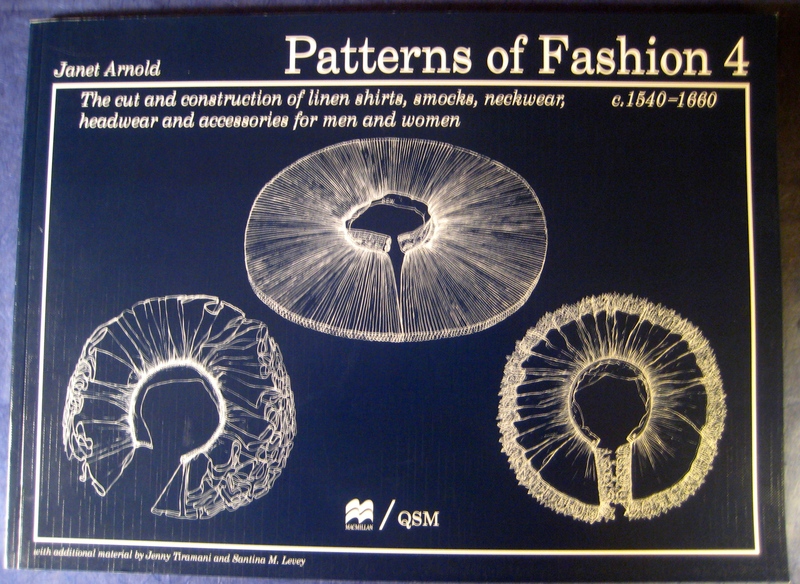 This book has x-rays and pattern diagrams of actual garments c.1540-1660. Yesterday afternoon, I tested and worked out the pattern for the embroidery. I left the mechanical pencil in the picture so you could get an idea of the scale. 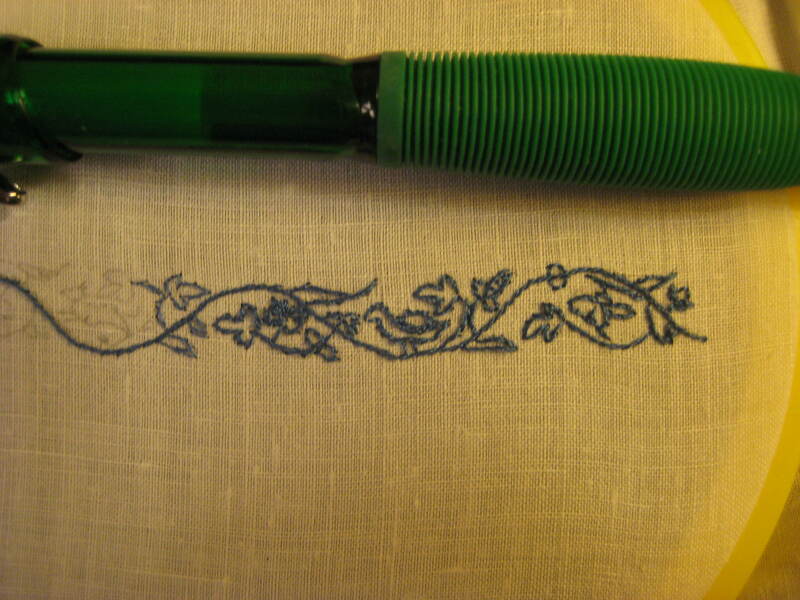 The pattern is just 5/16″ (8 mm) high and consists of birds, animals, flowers, vines and leaves. I need to work on the bird shape and make it more bird-like. I going to get the silk threads for my Cabinets of Curiosities course in late summer and will use them for the polychrome embroidery on the bodice, hat and shoes. My goal is to complete the smock and corset/stays before then. 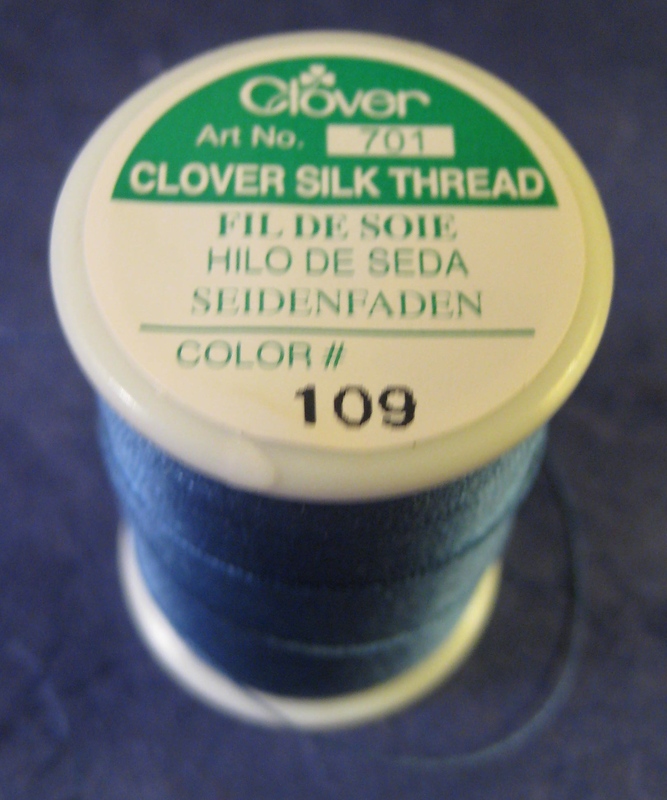 For the smock, I found Clover Silk Thread in color #109 Med. Blue at Amazon and it is perfect for this project. As you can see in the picture of my embroidery test piece above, I tried splitting the thread for an even finer line on the far left. It didn’t look good and was too fragile so I am going to use a full strand. For several months now, I have been researching and reading reviews of light boxes and was deterred by the high prices. However, I did find a cheaper one on Amazon and used it for the first time yesterday to trace my pattern. It’s the Huion Artcraft Light Pad and it worked perfectly. It was bright enough to see even the finest details of this tiny design. I am going to draw out the whole pattern for the embroidered neckband in an open square and stitch it as one piece. That’ll save me trying to miter the corners and will reduce the number of seams. The smock itself is made from rectangular pieces of fabric for the body and sleeves, triangular pieces for side gores, and square underarm gussets. I’ll show you my pattern pieces when I work them out. I tend to stew over and study a new project for a while before I finally get excited and confident enough to get started. My word, beautiful detail work. The light box is a fantastic idea and I’d bet it will be worth having! I’m excited to watch your progress!